SANTA FE – The New Mexico Game Commission adopted new rules Aug. 28 that will provide hunters planning to enter the public drawings for 2015-season bighorn sheep licenses in New Mexico with more opportunities and more choices than ever. Beginning next year, the department estimates it will make 36 bighorn ram licenses available in the annual public drawing, an all-time high. Sixteen of those licenses will be for Rocky Mountain bighorn rams. Twenty will be for desert bighorn rams, a remarkable increase from only one desert bighorn license issued in 2011. The increased licenses are thanks to successful reintroduction and management efforts by the Department of Game and Fish in partnership with the Wild Sheep Foundation, the Bureau of Land Management and private landowners. The 2015 bighorn drawings also will see some changes in the way licenses are allocated to state residents and nonresidents. To equitably distribute the bighorn licenses and comply with state statues requiring that 84 percent be awarded to residents, the department consolidated the available licenses for Rocky Mountain rams, Rocky Mountain ewes, Rocky Mountain ewe archery and desert bighorn rams into four individual license pools. This approach will not affect how bighorn herds are managed across the state, but it will enable the Department to distribute licenses consistent with state statute such that residents will receive at least 84 percent of the licenses, nonresidents six percent, and hunters who use outfitters will receive ten percent. By consolidating the licenses into the four pools, all three categories of applicants will have an opportunity to draw. The 2015 drawing also will include several youth-only licenses and some hunts for ewes. The new system also will enable hunters to rank their choices of hunts and areas for both Rocky Mountain and desert bighorns on their applications, effectively giving them six hunt choices. Previously, hunters had only three choices. 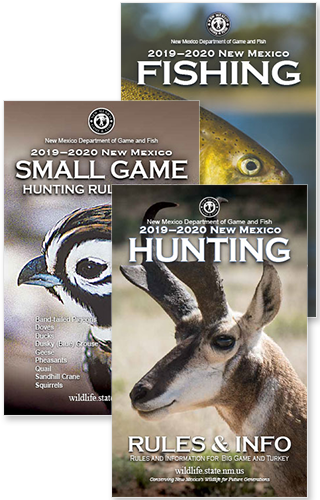 For more details about hunting in New Mexico and the state’s bighorn herds, please visit the Department of Game and Fish website, www.wildlife.state.nm.us. The rules and information booklets for the 2015-2016 hunting seasons, including maps, season dates, bag limits and more, will be available January 5, 2015. Information also is available by calling toll-free (888) 248-6866.